I am very excited for the upcoming events at Fletcher Allen Health Care in Vermont on Wednesday, March 5th. Take a look at the beautiful picture of Emily they are using for their internal posters (posted below) to promote these engagements. The detailed agenda is also available for download by clicking here. This event is going to have an enormous audience as we are planning to be webcasting these presentations throughout the entire state of Vermont and parts of New York! This is an exciting opportunity to really make a big impact with our story, and with the solutions we are prepared to present. Thanks for your continued support! Dr. Nathaniel Sims of Massachusetts General Hospital – Patient Safety Pioneer! Over the course of my patient safety advocacy I have had the opportunity to meet many heroes within our healthcare system. People who go in to work, day in and day out attempting the impossible…to reduce medication errors to zero. Very few have had a bigger impact on myself, and on our entire healthcare system as a whole than Dr. Nathaniel Sims of Massachusetts General Hospital. I had the pleasure of meeting Dr. Sims at this past year’s Association for the Advancement of Medical Instrumentation Conference, where I was one of the keynote speakers. We immediately connected with a strong bond due to our sense of purpose for a common cause. The Emily Jerry Foundation’s advocacy efforts have been focused on the usage and implementation of smart-technology to reduce the occurrence of medical errors (especially caused by human error) in our nation’s facilities. Dr. Nat Sims personifies this vision. Dr. Sims has spent his career attempting to innovate the drug infusion pumps which are the standard tool for delivering fluids into a patient’s circulatory system. Through his tireless efforts as advisor to the Center for Integration of Medicine and Innovative Technology (CIMIT) the newest breed of “smart pumps” are able to spot potential dosage errors throughout the process, as well as notice dangerous interactions and dosage limits that may be breached. These improvements have come at the perfect time as Federal officials have been worried about the increase in reports of drug delivery incidents and serious injuries linked to them. These innovations are saving lives each and every day. Dr. Nat Sims has had an incredibly distinguished career that has pushed the envelope further and ushered in an era of patient safety. On top of the smart pumps he is listed as an inventor on more than 10 Mass General patents for medical devices. The most recent innovation to be inspired by the Sims Lab is “smart” label technology. Licensed to Codonics, one of our great partners, the Safe Label System is utilized at the point of medication preparation and uses barcode technology to read information from a drug container and electronically identify it against the hospital’s approved pharmacy drug database. An audible and visual confirmation of the drug is presented to the clinician when scanned, and a Joint Commission compliant label is automatically printed containing the name of the drug, concentration, dilution and diluent (if applicable), any alert messages about the drug and a barcode for AIMS or BCMA integration. The easy-to-read, full-color labels are based on ASA guidelines for drug class and color. The entire process takes seconds and ensures syringes, or any labeled medications, are prepared error-free. The Emily Jerry logo can be found on SLS systems wherever they are being used in children’s hospital’s across the country as a reminder to take special care in pediatric preparations. We are so very excited to be associated with this technology and being a part of the process of moving it forward. Thank You to Dr. Nathaniel Sims of Mass General for being such an incredibly dedicated patient safety pioneer that made it all possible! Read more detail about Dr. Sims in the great article below published in Mass General Magazine. I am incredibly excited to announce I was asked to serve as the keynote speaker at the Intelligent Hospital Preconference Symposium to be held just prior to the 2014 HIMSS Conference. The Symposium will be held at the Hilton Hotel in Orlando, Fla., on February 23 at 8 AM ET. This was all made possible by the sponsors of my speech whom I am incredibly grateful for: MEPS Real-Time, Inc., a company on the leading edge of providing products and services focused on increasing patient safety in healthcare settings. Also, BD Medical, a segment of BD (Becton, Dickinson and Company), will be co-hosting my presentation with MEPS Real-Time, Inc. on Tuesday, Feb. 25, in the HIMSS Intelligent Hospital. Click here to read the Business Wire Press Release. Patient Safety Science & Technology Summit an Enormous Success! Last month, I was afforded the opportunity to participate, as a speaker, on a medication safety panel discussion in Laguna Nigel, California, for the annual Patient Safety Science and Technology Summit. This very important event is organized every year by the Patient Safety Movement Foundation, with the primary goal and focus on getting to zero deaths from preventable medical errors by 2020 in our nation. Unfortunately, recent studies have shown, very conclusively, that preventable medical errors are now the third leading cause of death, aside from cancer and heart disease, claiming an astonishing 440,000 lives every year in the United States. These are tragic and senseless deaths that do not have to happen! The following is the video of the hour-long medication safety panel discussion. 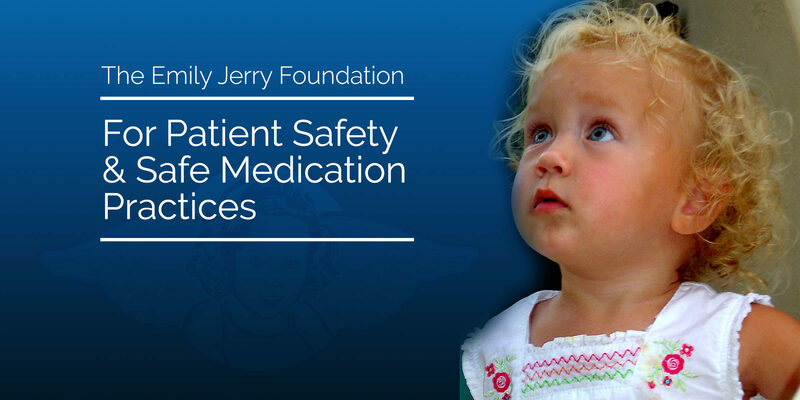 This panel discussion opens with the powerful video segment we just posted at the top of The Emily Jerry Foundation’s homepage that was produced by the Patient Safety Movement Foundation for this particular event. If your able, I would really like to encourage you to watch it, in it’s entirety, it will definitely help you to gain a real perspective of what The Emily Jerry Foundation is all about! Early last year, when I first learned about the Patient Safety Movement and their primary focus of reaching zero deaths from preventable medical errors by 2020, I must admit, I was a little skeptical as to whether this was actually realistic and achievable. Quite frankly, I thought this primary objective might be a bit audacious and unattainable. After working with Joe Kiani, their founder and Sheila Creal their President, as well as, the rest of their remarkable team, these past six to eight months during the planning phases of their second annual Summit, I have learned how mistaken I really was! All of my initial thoughts and opinions have dramatically changed. I now believe, wholeheartedly, that the Patient Safety Movement’s goal is definitely achievable and, subsequently, The Emily Jerry Foundation will continue to support their efforts to help make this vital objective happen by 2020! I am now firmly convinced that by continuing to all work together, to get everyone around the globe to rally behind our cause, we can make this goal a reality together! At some of the other medical events focused on patient safety and quality of care, where the participants always had the best of intentions, there were times when I felt like everyone was just talking about the programs and measures they could use, to improve overall patient safety, however, they weren’t really taking action and being held accountable for their assurances to adopt and implement these vital programs and measures at their individual hospitals. With that general thought in mind, I think this is what really sets this Patient Safety Science & Technology Summit apart from many other functions I’ve attended in the past. What truly distinguishes this event apart from others, is the fact that they are requiring attendees and participants to make formidable and measurable commitments to adopt and implement the best practices and technology solutions that are proven to effectively save lives. Once a commitment is made by a medical facility, a technology manufacturer, or other entity involved with the Patient Safety Movement Foundation, that commitment is then published on their website (http://patientsafetymovement.org/), for everyone to see. Then at subsequent meetings, everyone involved holds one another accountable for the progress made on that previous commitment. The benefits of this type of program are two fold, as it provides for measurable results for the solutions developed by everyone involved, in addition to, the accountability factors I just aforementioned. In all my years of working in patient safety and quality of care, I have never had the opportunity to spend so much time, at an important event like this, with so many influential leaders from industry, the government, the medical community, etc., all assembled and working together to not only come up with “solutions”, but all aligned and making actual commitments within their organizations to take the subsequent actions that make these particular “solutions” effective. In addition to all of the amazing people I had the honor of meeting at the Summit, I also had the distinct privilege of meeting former President, Bill Clinton at a small reception prior to his keynote speech. Click here to view local coverage from CBS – LA of President Clinton’s speech. President Clinton is someone I admire and one who has been an inspiration to me, with respect to all of his ongoing humanitarian efforts with The Clinton Global Initiative. Everyone seemed to share my same deep-seated passion about addressing these core issues that are tragically claiming an astounding number of lives every year. Most importantly, all of these esteemed leaders I met and had the opportunity to spend time with, appeared to have the genuine mindset of “doing whatever it takes” to join together, in a focused and concerted effort to save countless lives and ultimately get to zero deaths from preventable medical error by 2020! 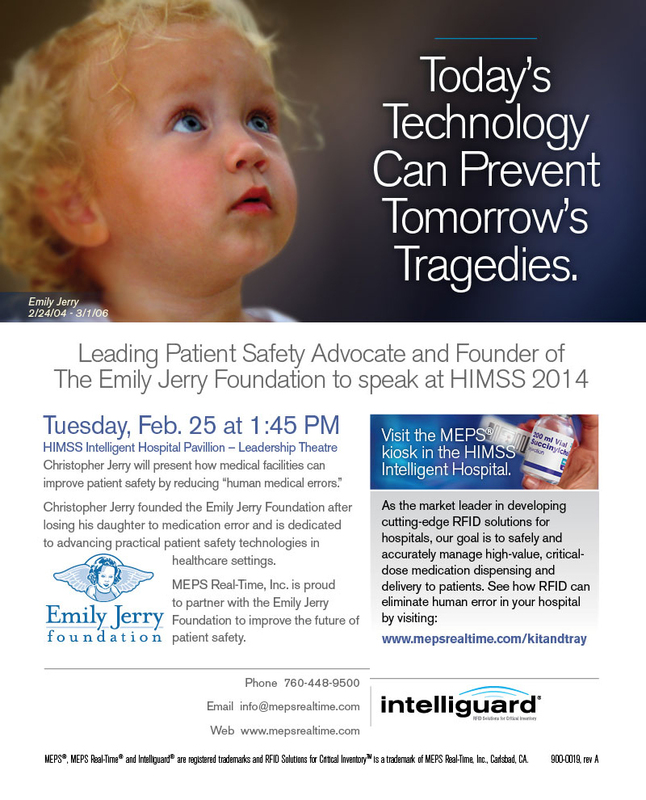 The Emily Jerry Foundation is proud to announce our partnership with MEPS Real-Time® at HIMSS 2014. Based in Carlsbad, Calif., MEPS Real-Time is a leading provider of Radio Frequency Identification (RFID) solutions for medication management in the pharmaceutical and healthcare industries. This partnership continues to support my ongoing efforts of achieving ZERO preventable medical errors by 2020. Combining MEPS’ Intelliguard® product portfolio with my patient safety advocacy is a natural fit and one that will help me continue to advocate for patient safety on a national level. • Sunday, Feb. 23, 8:00 AM at the Hilton Hotel Orlando: keynote speech at the Intelligent Hospital Preconference Symposium. • Monday, Feb. 24, 5:30 PM at the Orange County Convention Center, Leadership Theater, Intelligent Hospital Pavilion: During the RHCC and Intelligent Hospital Awards banquet, Jerry will accept an award on behalf of the Emily Jerry Foundation that recognizes leaders in advanced healthcare technology solutions. Q&A with press to follow. • Tuesday, Feb. 25, 1:45 PM at the Orange County Convention Center, Leadership Theater, Intelligent Hospital Pavilion: Jerry will present a talk on how medical facilities can be made safer by identifyingtechnology proven to minimize “human medical errors.” Press conference with Q&A to follow in the Intelligent Hospital Welcome Center. Be sure to visit the MEPS website whenever you get a free moment to learn more about the innovative work they are doing! I was very excited to be interviewed by Healthcare IT News regarding my upcoming appearance at the HIMSS 14 Conference in Orlando, Florida. An excerpt of the article is below, along with a link to the full text. Please take a moment to check it out! Healthcare system designers who ever feel the need to be reminded on why their work is essential need only spend a few minutes with Chris Jerry. He was a veteran of the healthcare technology world, with more than 10 years experience as a sales manager of medical devices, when doctors discovered a large yolk sac tumor in his eighteen-month-old daughter, Emily. Jerry’s confidence in medicine was rewarded for a time. A series of surgeries and chemotherapy sessions were successful in removing the tumor and Emily was close to a full recovery. Read the full article at HealthcareITNews.com.